Raven & Willie have been together since high school. It all started at Heritage High where Raven loved to play with Willie’s hair. Who would have known that years later she would be marrying this boy. These two make an incredible team. So full of fun and life. I have loved getting to know Raven & Willie. Raven is gorgeous with a smile that is so contagious! Willie is just a good ole country boy that loves Raven with every part of him. This past Saturday there were so many happy tears. From sisters, moms, and friends. Everyone was waiting for this day and it was surreal that it was finally here. The weather was forecasted to rain all day. We were ready. No matter what the weather said… we were ready. However, miraculously the rain held off and we were able to do all portraits outside. It was perfect for them! The Women’s Club of Portsmouth is such a pretty venue. The vaulted ceilings with the chandelier lighting was beautiful! And with the blue and blush accents of the day it made this venue the absolute perfect pick for Raven and Willie’s Wedding. 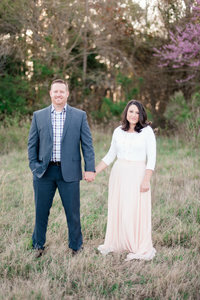 Thank-You Raven & Willie for having us capture this exciting time in your lives! We absolutely have loved getting to know and we truly wish you guys a lifetime of love and happiness!!! Raven has 5 sisters and now after marrying Willie…. 6!! !